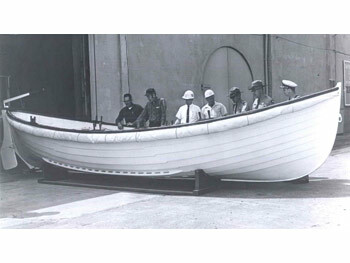 Many of the Beebe type motor surfboats were conversions of previously-built pulling version Beebe surfboats. Neither self-righting nor self-bailing. Dimensions: 25ft. 4in. overall length, 7ft. beam; single 12HP, horizontal, 2-cylinder/2-cycle Van Auken/Aristox gasoline engine with twin propellers; maximum speed about 8.5 St. MPH; nearly double-ended clinker built hull of cedar planking over oak frames; copper fastened. Nearly all Beebe-McLellan type motor surfboats were purpose-built versions rather than conversions of the pulling/sailing model. Self-bailing but not self-righting. Dimensions: 25ft. 4in. overall length, 7ft. 0in. maximum beam, 2ft. 9in. 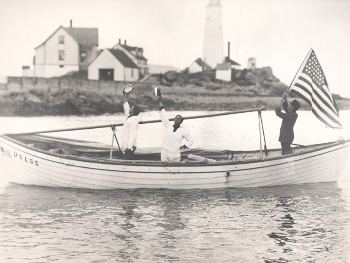 depth amidships; single 2 cylinder horizontal, 8HP Van Auken gasoline engine with twin propellers; maximum speed 7.11 St. MPH; equipped for rowing and sailing as in pulling model, but with one less thwart (i.e., 3 thwarts for 6 oars rowed double-banked plus either steering oar or tiller/rudder); double-ended clinker built hull of cedar planking over white oak frames, copper fastened.